Bunnies, jelly beans, Easter eggs, and more! Of course, all of the classes made their very own special bunny rabbit to display! We also had fun sorting out jellybeans by color and then enjoying a few too! 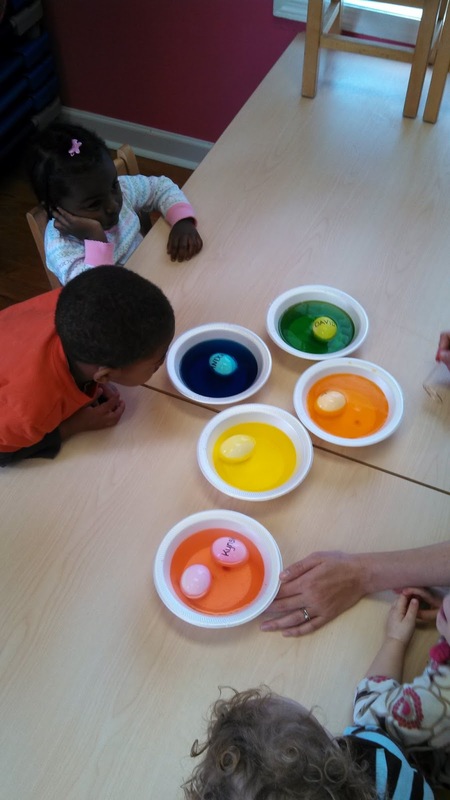 The children had a great time dyeing Easter Eggs this week too! These are all things we enjoy during this time of the year but it's important that we focus on the reason we celebrate Easter. The children enjoyed doing a special activity with Easter Eggs in which each egg had a different item in it to represent a part of the Easter story. It really helped the children to understand how special Easter is for us. They also made their own crosses as they learned about the importance of the cross. We hope you all have a very Happy Easter and enjoy time with family and friends! At least it's supposed to be! Wednesday is the First Day of Spring but as you probably know, sometimes it seems like we skip a season here in Alabama! There are signs of Spring all around us as the trees are turning green and the flowers are beginning to bloom. Of course with this new season comes changes in temperature and RAIN! 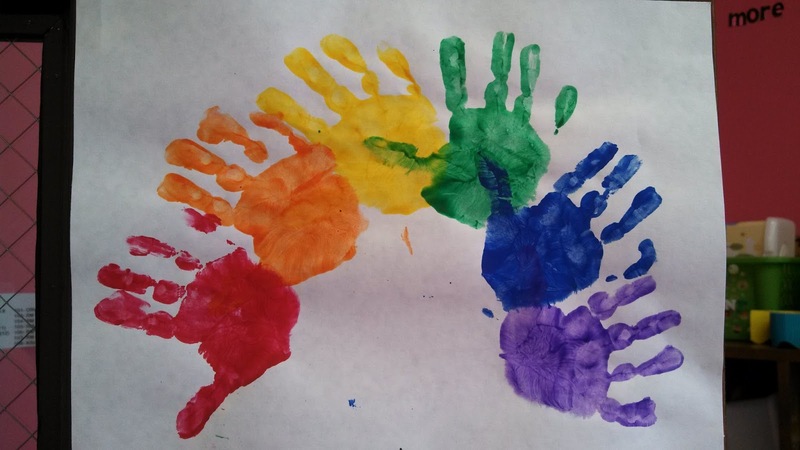 The children learned this week about all these different changes that we will see over the next few weeks. For Math, they counted raindrops and matched numbered umbrellas to the cooresponding numbered rain drop. We also enjoyed playing in the wind with the kites they made from paper plates. Our cooking project this week was "Flower Biscuits". They looked pretty delicious! a hole in the middle and added a scoop of jam. Our sweet cook then baked them for us! Luck of the Irish to you! We are covered in GREEN this week! 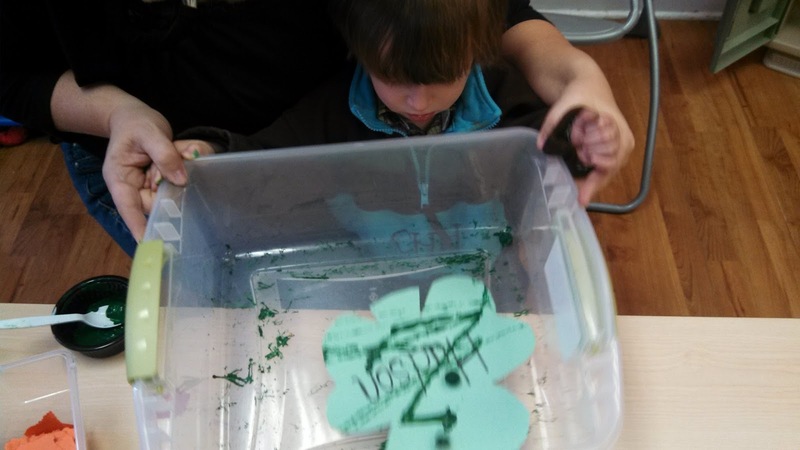 So many fun art activities took place this week as we talked about rainbows, shamrocks, and pots of gold! 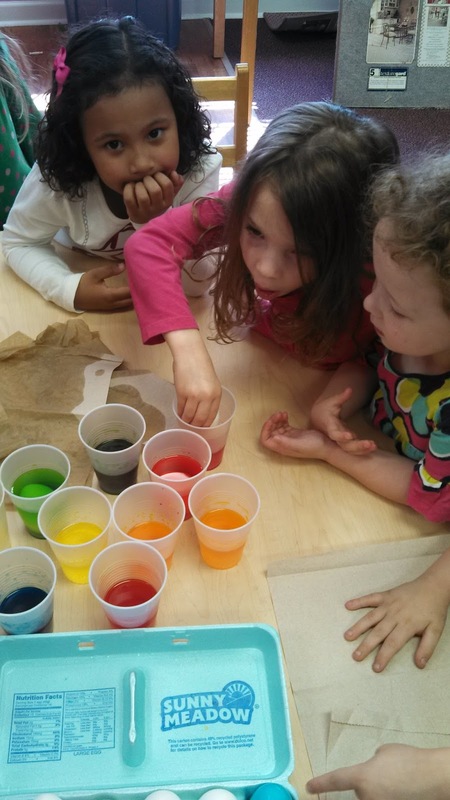 Learning about the colors of the rainbow! 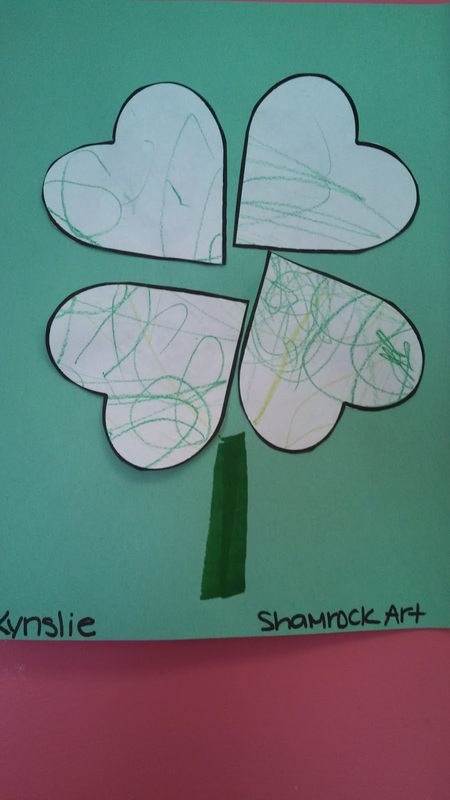 The fun continued with our Math lessons as the children talked about symmetry and made a Shape Shamrock using hearts and a rectangle. 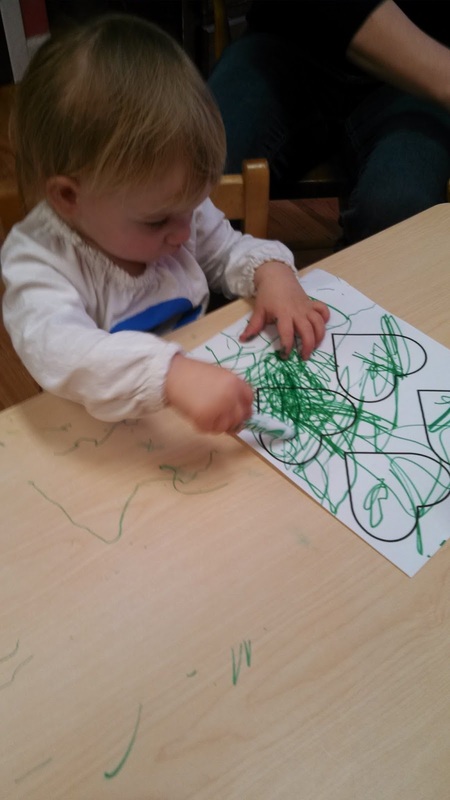 Coloring her hearts to get them ready to make a shamrock. Don't forget to wear green on Sunday so you don't get pinched!!! -"Cat in the Hat": We practiced balancing by trying to hop on one foot, stand on our tippy toes, walk on a line, balance things on our heads, and even stacking up blocks! -"The Foot Book"- The children measured different items in their room with their own feet! -"One Fish, Two Fish, Red Fish, Blue Fish"- We all love goldfish so for a math concept, we practiced counting and estimating! -"Ten Apples Up on Top"- Using 10 paper apples with one number on each, the children practiced putting the apples in number order. 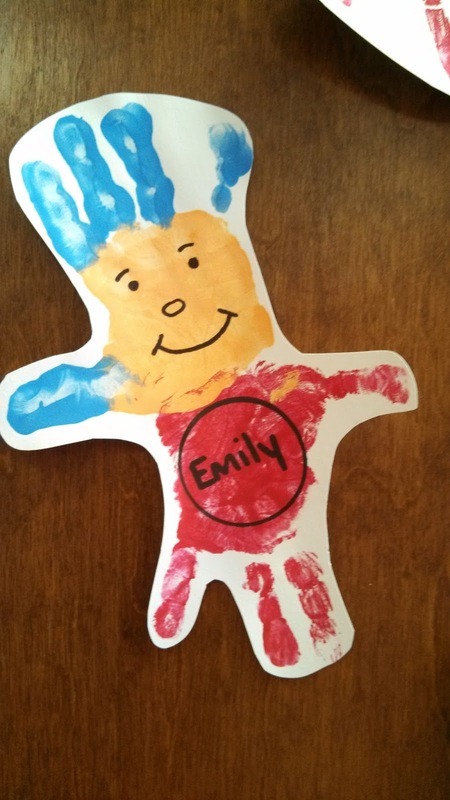 Thing 1 fun using their own hands! 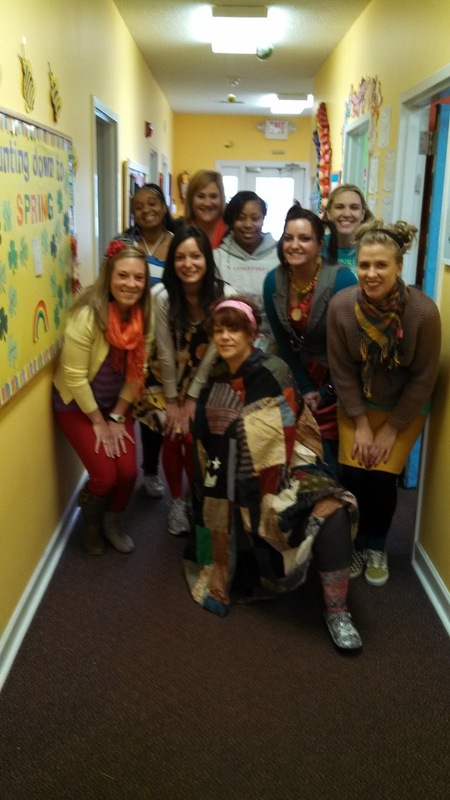 We even had "Wacky Wednesday" where all the children and teachers dressed in their most wacky outfits with CRAZY hair! 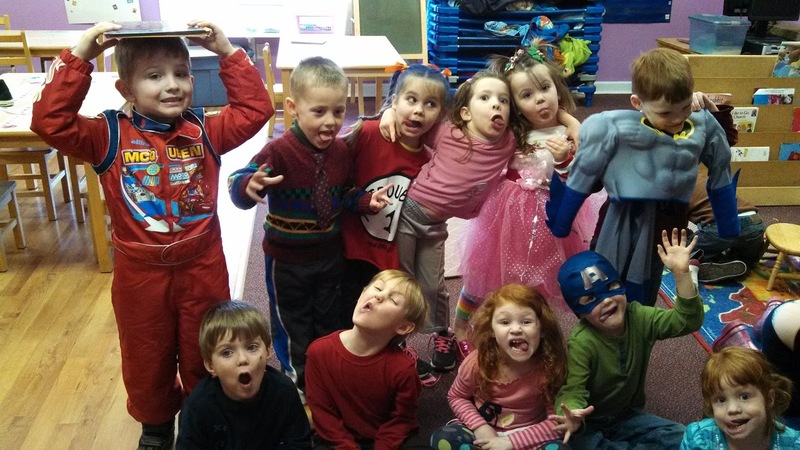 dressing up than the kids did! 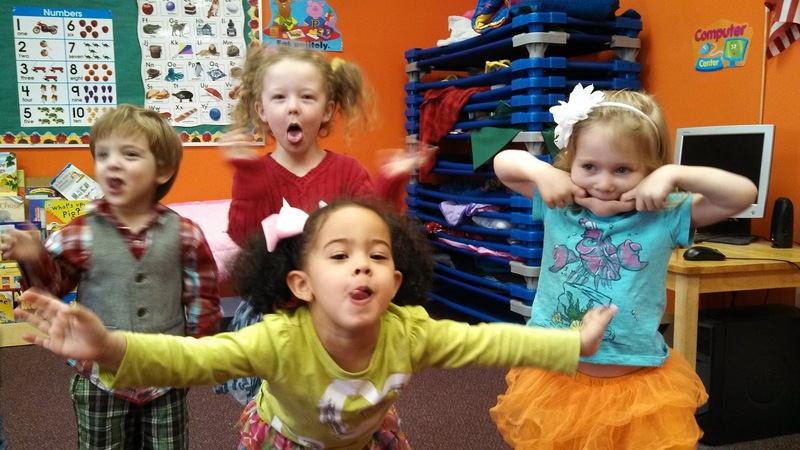 Some of our WONDERFUL WACKY kids! What's your favorite Dr. Seuss book?? 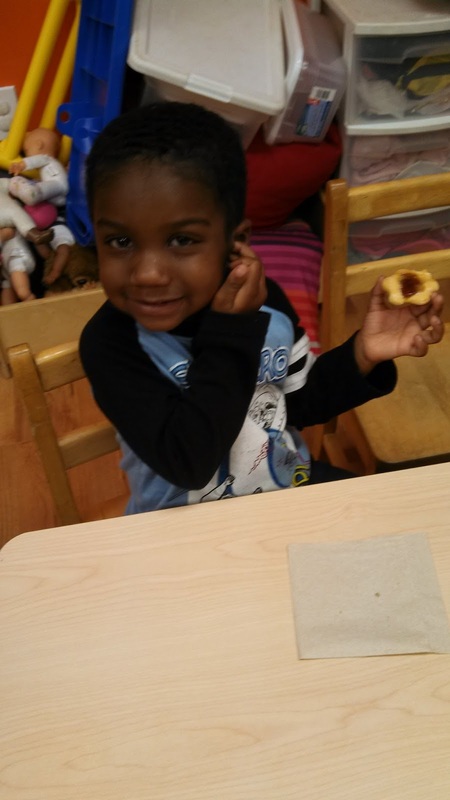 February is just jam packed with important things to celebrate and learn about! 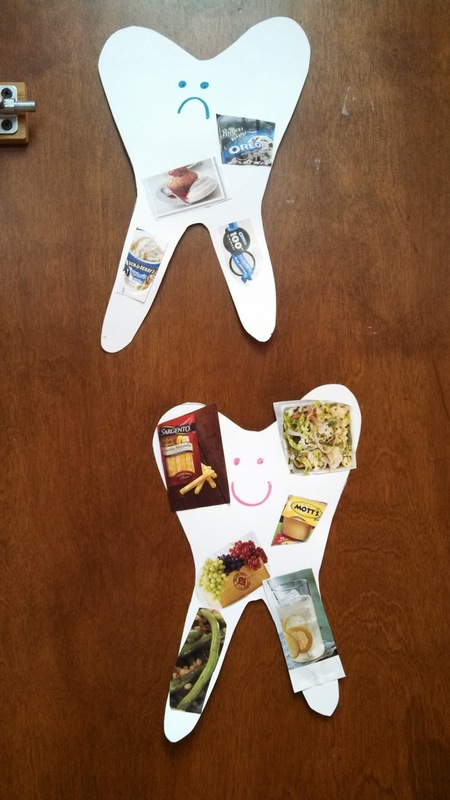 It's also Dental Health Month so we are taking the week to learn about taking care of our teeth. 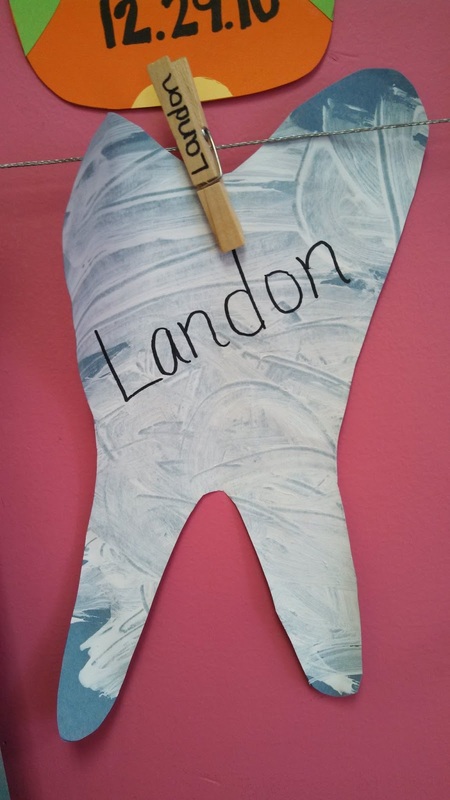 The art projects consisted of painting a paper tooth, making a large toothbrush, and turning the bottom of a coke bottle into a tooth! They also did a food sort to determine the difference between good and bad foods. We practiced singing "Happy Birthday to You" while we pretended to brush our teeth to get use to the right amount of time. Hopefully our hard work at developing good habits will pay off!